Whether it's on Instagram, Facebook, or a real live holiday card, a fantastic backdrop can make a good photo GREAT! With no lack of amazing scenery in San Luis Obispo county, here are a few you may not know about, but that will make your holiday photos unforgettable! Just up Highway 1, in Cambria, is Fiscallini Ranch Preserve. Free to the public and open daily from dawn to dusk, this property offers over a mile of ocean view bluffs with a meandering boardwalk, amazing vistas and a variety of cool benches, perfect for that family photo! Pack a picnic, as it is a great place for a walk, to explore nature or just get away as well. I remember years ago when this tasting room was first built, being blown away by the view. Just past the airport in San Luis Obispo, you turn the corner and enter the vineyard. However, it is not until you step into the tasting room that you fully appreciate the fantastic landscape and you feel as if you are sitting in the middle of the vines. Stop in to taste some wine and snap a pic or two in front of this framed masterpiece. Truly magical! Not only is a coup to find a place that others haven't photographed, but to find a historic spot that not many people even know about is pretty cool! With fabulous vistas of Avila Beach, Port San Luis, and Harford Pier, the Lighthouse is accessible only by guided tour on Wednesdays & Saturdays (reservations are required). Along with expansive ocean views, you also have a chance to tour the lighthouse and learn its history. Located just on the fringe of the Cal Poly campus is the trail-head to Poly Canyon. This 4 mile round trip hike can be a little strenuous, so be prepared, but what greets you at the top is incredible! 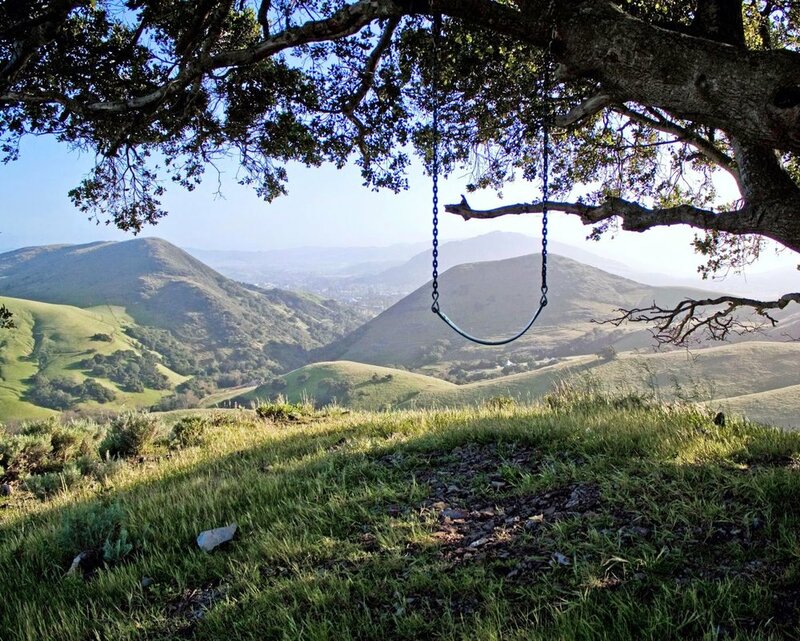 Perch yourself (or your kiddos) on the swing and celebrate the fantastic views of San Luis Obispo as far as the eye can see. Pump your legs a little and relive your carefree childhood! Of course, I would be remiss not to mention our own "backyard". Easy to get to if you are a guest, or stop in for a refreshing libation on our patio and stay for the view! Snap a pic from your table, gather on the lawn, with its panoramic views of the Pacific, or find our Selfie Spot. No Photoshop necessary, we are fortunate to have this amazing blue backdrop 24/7, fabulous during the day and stellar at sunset, please come and enjoy. Hint ~ find the beach stairs, great ocean view photo op right at the top!